Cost: $5,395 four credits, undergraduate and $5,895 graduate. $6,395 five credits undergraduate and $6,895 graduate. Cost includes tuition, fees, food, lodging and daily transportation to the sites. Deposit: $500 (required upon registration) Cost does not include airfare to Reykjavik . Airfare from US to Reykjavik ranges between $600 and $1200 USD depending on starting point. Registration on a rolling basis until filled. Course limit is 18. Additional registrants will be waitlisted. Arriving Reykjavik no later then July 17 and departing no earlier than August 10 (four credits) and August 14 (five credits). 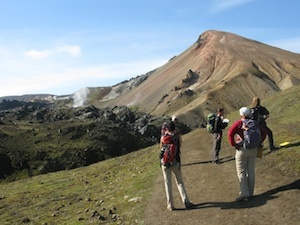 Iceland is a volcanic wonderland ( Iceland Field Camp pics. 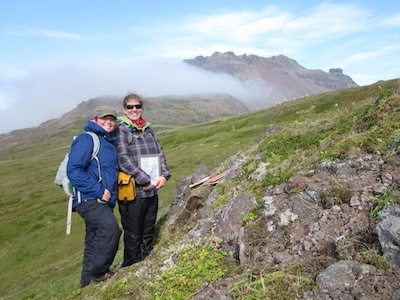 )This course in volcanology will explore Iceland from the south coast where the Mid-Atlantic Ridge comes ashore to the highlands near the focus of the Iceland mantle plume. Subjects that will be considered include: basaltic and rhyolitic lava flows, tephra characterization, phreatomagmatic features, subglacial volcanism, volcano monitoring and geothermal power. Projects will be conducted on active volcanic systems, in Late Pleistocene and Holocene volcanic fields, and in the Tertiary volcanic stratigraphy exposed in glacial valleys and fjords of Iceland. Prerequisites: Mineralogy, and petrology required; stratigraphy, structural geology, and volcanology helpful but not required. Exceptions will be considered upon request. Physical demands: Field work will involve working off-trail in rugged terrain, and may include several hikes of considerable length. Students should be both physically prepared and comfortable with steep terrain. Climate: Iceland weather is highly unpredictable, but is cool and mild in the summer with typical highs in 50’s (F) and lows in the 40’s. Late summer weather is relatively good, but periods of rain and high winds are not unusual. Facilities: Lodging for most of the program will be tent camping in developed campgrounds. Several days of office work (compilation and and report-writing) will be based out of hotels/hostels with basic accommodations. The first and last nights of the program will be spent in Reykjavik. Students will need to supply their own camping equipment, tent (or arrangement to share), sleeping bag, and pad, as well as a basic “mess kit”. Other required equipment: Basic geology tools including hammer, hand lens, rite-in-the- rain notebook, map case, colored pencils, Brunton compass (or equivalent), and a GPS unit (note: the latter two items can generally be borrowed from student’s home institutions; in special cases these can be borrowed from the camp). Students will need a laptop computers to complete reports. Suitable clothing for working in cool wet conditions including waterproof breathable coat, rain pants, fleece layers, good rugged hiking boots, and appropriate socks. A complete equipment list will be provided for participants ahead of the camp. Application and deposit of $500 online. BHNSFS reserves the right to cancel the camp if the minimum enrollment is not reached. The full deposit will be refunded in this case, and applicants will be notified via email by January 1, 2019.